The international community handed Iran a collective pass this week as it commemorated its annual landmine awareness day with almost no mention of the growing strife in Yemen, where around one million Iranian landmines have been placed underground, threatening scores of civilians. The United Nations, which holds events to bring attention to International Mine Awareness Day, neglected to mention Iran and its Houthi-backed terror forces in Yemen, the only global conflict where thousands of landmines are still planted underground on a weekly basis. U.N. Secretary General Antonio Gutierrez did not mention either country in his statement on landmines. Instead, it was left to the U.S.-aligned Yemeni government and the Saudi relief agency engaged in determining operations to call attention to what experts have described as the world’s worst ongoing crisis regarding landmines, which routinely wound civilians and children long after a conflict ends. U.S. lawmakers also largely passed on publicly condemning the worsening human rights situation in Yemen, which has emerged as a top foreign policy debate in Washington, D.C., in the wake of the murder of Jamal Khashoggi. Many members of Congress have sought to cut off U.S. assistance to the Saudi military campaign against the Houthis as a sort of punishment for Khashoggi's mysterious murder. Critics of this stance have argued that it should be a priority for the United States to thwart Iran’s ongoing military campaign in Yemen. "The Iran-backed Houthi extremists have employed many war tactics that violate international law and threaten the human rights of all Yemeni citizens," Yemen’s government said in a statement commemorating Mine Awareness Day. "One of the most sinister of their terror tactics is the use of landmines around Yemeni cities, farms, and residential areas. These mines threaten the security of innocent Yemeni citizens, impede the delivery of humanitarian aid, and prevent Yemenis from travelling to much needed facilities like schools, hospitals, and markets." Iran's terror proxies are said to have planted "more than one million land and sea mines in Yemeni territory and bodies of waters," according to Yemen’s government. "The United Nations and several independent groups have found that components for Houthi mines originate in Iran. This illegal transfer of arms by Iran to the Houthi extremists violates multiple UN Security Council Resolutions and destabilizes the entire Middle East." Saudi Arabian officials, who have worked to stem the flow of Iranian militants in Yemen, are said to have cleared around 50,000 mines from the battlefield since the conflict began in 2014. The vast majority of these landmines, however, still remain in the ground. Already, these mines are said to have caused nearly 1,000 deaths, and "they will continue to threaten unsuspecting Yemeni civilians for decades to come, creating generations of maimed people with far-reaching repercussions for individual families and society as a whole." Sources tracking the situation say the U.N. and even some in Congress are providing Iran’s proxy forces with cover as debate rages about how the United States will handle its relationship with Saudi Arabia in the wake of the murder of Jamal Khashoggi. 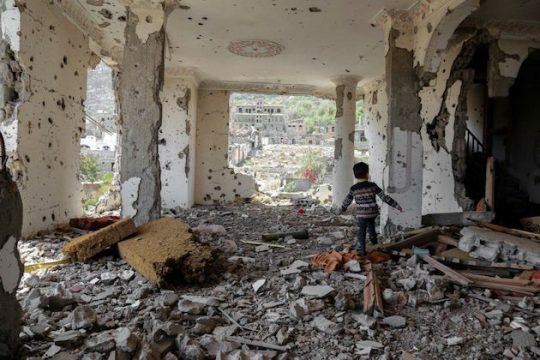 "There has been a consistent disconnect between what the U.N. and others know is happening in Yemen, and what they want to say," said one source who has been involve in international mediation efforts related to Yemen. "There is so much concern about upsetting Iran and the Houthis, to the point they abandon the peace process," said the source, who would only speak on background. "As a result, the Iranians and the Houthis are literally getting away with murder." This entry was posted in National Security and tagged Iran, United Nations, Yemen. Bookmark the permalink.